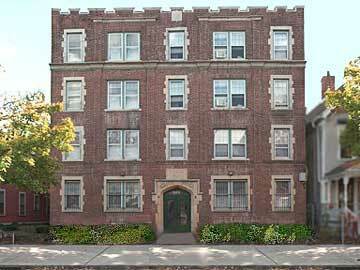 179 Dwight Street: Four story brick 1920's walk up (no elevator) featuring 29 1-bedroom units (380 sq. ft.); 3 one bedroom plus study units (440 sq. ft.); 1 large 2 bedroom unit (760 sq. ft.). The apartments include a huge walk-in closet, large windows and hardwood floors. Rent includes hot water. On-site laundry room and bike room. Cat friendly building. 2 bedroom flat $1,410 Amazing layout in this renovated garden level two bedroom apartment. Hardwood floor throughout, open kitchen with breakfast bar, granited counters and dishwasher- great space and light! Separate entrance, across from laundry and bike room! Rent includes hot water.